Steven Taylor scores a major coup! On last night's The National on CBC, host Diana Swain offered the state-run broadcaster's "regret" for the biased editing/reporting done in Christina Lawand's piece that I (Steven Taylor) exposed right here on this very blog. Thanks to all of those that wrote into the CBC expressing your disgust. One reader has already emailed to complain that an apology was not forthcoming (the CBC "regrets" what happened) What are your thoughts about this? What are your thoughts on the state of media in Canada today? More Left-wing MPs are weighing in thier support for Hezbollahs removal from Canada's terrorist organisations list. One has to wonder just how retarded they think Canadian voters are. The Lebanese-based militant group Hezbollah should be removed from Canada's list of banned terrorist organizations, two Canadian MPs say. Boris Wrzesnewskyj and Peggy Nash made the comments Sunday during a fact-finding mission to southern Lebanon as Israeli troops continue to withdraw from the region following 34 days of conflict. Wrzesnewskyj, a Liberal MP from Toronto, says the visit has shown him how integrated Hezbollah is into Lebanese society. In the interest of peace, he said Canada should reconsider its 2002 decision to place the group on its list of banned terrorist groups. 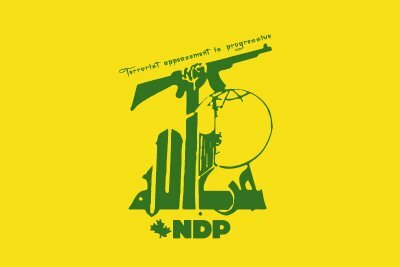 And this morning I damned near choked on my breakfast when another NDP MP stood up for Hezbollah! Then I got to thinking, maybee the NDP need a new flag to show thier true colors. So I made them one!